For a long time, the satellite communication (SATCOM) industry has enjoyed a rather stable distribution structure, with clear demarcation points among key stakeholders in the value chain. Distance and a lack of terrestrial infrastructure are two of the key challenges to organizational communication in Africa. As one of the major remote working industries, mining companies know this and use VSAT to ensure reliable voice and data communication on the African continent. However, feeling the pressures of the global financial environment as much as any industry, operational efficiency has come very much to the forefront in the mining world. This year’s IBC topped out at some 55,000 visitors (up 2,000+ on 2013), and became another record year for attendance. The sun shone and there was a definite sense of optimism around the halls, especially Hall 1, the event’s home to the satellite broadcasting community. At first look, the headline may seem to be an unusual combination of continents to compare and contrast. Africa is about three times the population of South America, twice the area and more than one and half times more dense in terms of people per square kilometer. South America on the other hand, has a GDP per capita that is almost four times that of the African continent. Kim Gram has held the position of Vice President Aeronautical Business Unit at Cobham SATCOM (previously Thrane & Thrane A/S) since 2009. Looking to reduce their dependency on fossil fuels, utilities are turning to green energy sources such as solar and wind power for cost effective and flexible alternatives for increasing their power generation capabilities. In recent years, Hispanic content has rapidly gained popularity worldwide, presenting a prime opportunity to develop alliances and create new revenue streams within the market. Everyone can agree that providing a region with broadband access brightens economic outlooks. Studies show that joining the connected world correlates strongly with improvements in per capita income. AeroMobile was the first mobile service to operate on a commercial flight in March 2008 and, since then, more than 20 million passengers have successfully connected to the AeroMobile network. The world is becoming more mobile—that’s no secret. Regions such as the Middle East and Africa (MENA), in particular, are experiencing a dramatic increase in demand for Internet-enabled mobile devices. Having worked in this industry for more than 20 years, I feel comfortable asserting that I have witnessed communications go though an astronomical transformation. Even—especially—within the satellite industry. Seeing A Better World Via WorldView-3... A DigitalGlobe Perspective, WorldView-3 satellite imagery, is highly competitive with aerial—in cost, availability and quick accessibility. 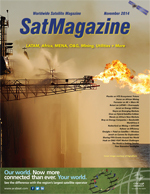 Satellite imagery, and the information derived from it, is playing a greater role in the management of exploration and production operations as oil and gas companies increase activities in remote regions of the world. Mining sites are often located in some of the most remote locations in the world. These outlying locations make communication difficult when attempting to successfully connect people, equipment and the enterprise system via cellular or radio technology. However, going without crucial communications is not an option—visibility is essential for critical decision-making. Ali Ahmed Al-Kuwari is Chief Executive Officer (CEO) of Es’hailSat. Prior to this appointment Mr. Al-Kuwari was Assistant Secretary General at ictQATAR. He also held the position of Finance Director at ictQATAR and was a member of the organization’s management team overseeing the strategic investment in the satellite initiative which became Es’hailSat. No matter how you look at it, satellite technology’s impact on the machine-to-machine (M2M) market is palpable. The landscape for oil and gas (O&G) companies has evolved to a point where M2M applications are now used to optimize operations from asset tracking, to communicating remotely with systems all over the globe, to running 24-hour monitoring schedules, while enduring both natural elements and influence from unexpected factors. Today, more than six billion people around the world can’t imagine life without their mobile phones or PDAs. As a matter of fact, there’s a whole generation that can’t even remember when these devices didn’t exist. And the service juggernaut continues to grow rapidly across all nations and demographics, fueled by the seemingly insatiable demand for Internet access. Communication via satellite is the most reliable method to reach off-shore and remote sites. Engineers and supporting staff must have good voice quality and stable data transmissions among all of the relevant sites. A Norsat Case In Point: Sharing FIFA Events With The World, Norsat and Televisa had a hand in making certain that happened. Africa’s proven oil reserves have grown 120 percent in the past 30 years, from 57 to 124 billion barrels, with at least another 100 billion barrels forecasted to be discovered. Proven reserves of natural gas have grown 140 percent in that same time period. Brian Collins was appointed as Chief Executive Officer of One Horizon Group in July 2014 after successfully guiding the company to list on the Nasdaq stock exchange in the same month. Mr. Collins joined One Horizon Group as Chief Technology Officer in 2010, following its acquisition of Abbey Technology, a software company that he founded in 1999. Mr. Collins is the co-inventor of the Horizon software solution. The world may be getting ever smaller, but it’s unlikely that the globe will ever be small enough not to need more innovative communication methods. Rick Lund has more than 35 years of experience in communications technical operations and continues to serve as a leading subject matter expert on the utilization of satellite and Wi-Fi technology for critical missions in business and government.